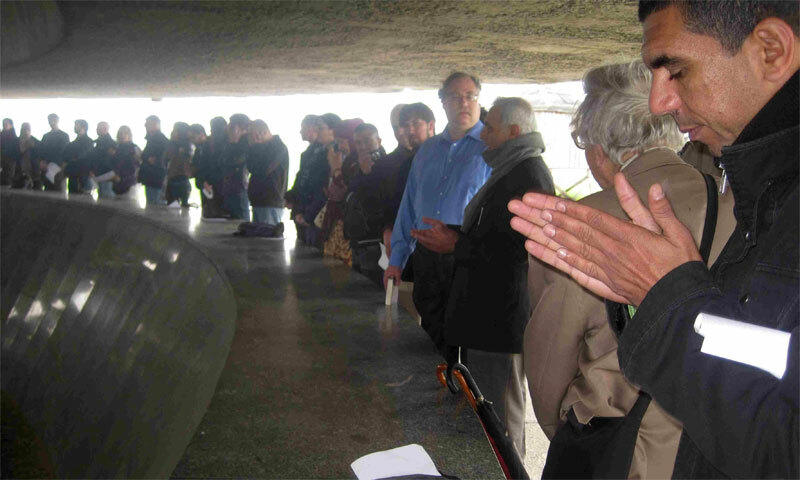 Visitors to Majdanek, including Rabbi Alan Brill, fourth from right, pay homage to the victims of the Nazis. They were Christians, Muslims, and Jews from Africa, North America, Europe, and the Middle East. They converged on Lublin, Poland, for four days in May to consider intergroup relations, with Majdanek — the nearby Nazi concentration camp — as their backdrop. Brill, who holds the Cooperman-Ross Distinguished Professor Chair in Jewish-Christian Studies at Seton Hall University in South Orange, is a veteran of many inter-religious encounters. But, he told NJJN in a May 18 telephone interview, the multi-faith pilgrimage to Majdanek was one experience he did not want to miss. It was arranged by Yehuda Stolov, executive director of the Interfaith Encounter Association, whose website says it is “dedicated to the promotion of co-existence in the Middle East, through cross-cultural, religious study and dialogue.” Brill is a member of its advisory board. The 60 people who were in Poland included 10 Jews, 20 Christians — including Christian Arabs from Jordan, Egypt, and Lebanon — and 30 Muslims from Israel, the West Bank, Jordan, Egypt, Morocco, and Bosnia. The bond they made transcended their differences in religious belief, he added. Although it lasted only several hours and came at the end of four days of group discussions and workshops, the tour of Majdanek was the centerpiece of the gathering. Encounters like these represent a new trend in interfaith relations, said Brill. Iris Gjinish, an Albanian Muslim, was among the trip’s participants. She is manager of women’s projects at the Institute for European Regional Development in Tirana. “As I was visiting the barracks used to house prisoners of all ages, seeing firsthand where such horrific atrocities were committed and learning about how cruelly they had been treated in that Nazi camp, I kept asking myself the same question: Why?” she wrote in an e-mail to NJJN. Sulaiman Khatib, a Palestinian graduate student active in an Israeli-Arab peace group called Wounded Crossing Borders, also corresponded with NJJN by e-mail. During his visit to the camp, he “really couldn’t believe that humans could reach this level of killing and humiliating others. I felt the pain and the suffering of all people who been tortured and killed. I was crying in my heart and praying that tragedy will never happen again. “Part of me was thinking how we together, Muslim and Jewish and others, can do more efforts to prevent any kind of killing between us over the Palestinian-Israeli conflict,” said Khatib.